(Nanowerk News) Researchers at Aalto University have developed a new method to implement different types of nanowires side-by-side into a single array on a single substrate. The new technique makes it possible to use different semiconductor materials for the different types of nanowires. 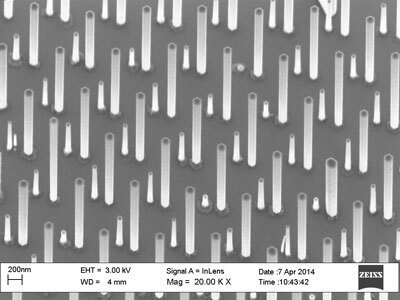 The research results were published in the Nano Letters journal on 5 February 2015 ("Fabrication of Dual-Type Nanowire Arrays on a Single Substrate"). Nanowire structure - Initially the substrate is prepared by depositing Au nanoparticles on it and covering it with a hole-patterned oxide. The first nanowires grow from these holes and after the oxide is removed, the other type of nanowires are grown via the deposited nanoparticles. The resulting dual-type array is presented on the electron micrograph on the right.